My five year old has the heart of an explorer and a real love for mountains and camping, just like his mommy. 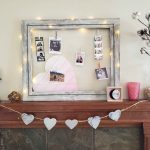 So naturally, I am encouraging this love and wanted to inspire him with a simple and comfortable space. Though there is SO much more that I could do, I am just honestly tapped out physically and financially with this one at the moment. I wanted to make Liam’s bedroom a special and calming place for him where he can go and read or draw in peace. His bedroom before was a mismatched colorful array of furniture and art that I had just thrown together a couple years ago. I wanted a little space that felt more curated and special. A room that Liam and I enjoy being in. 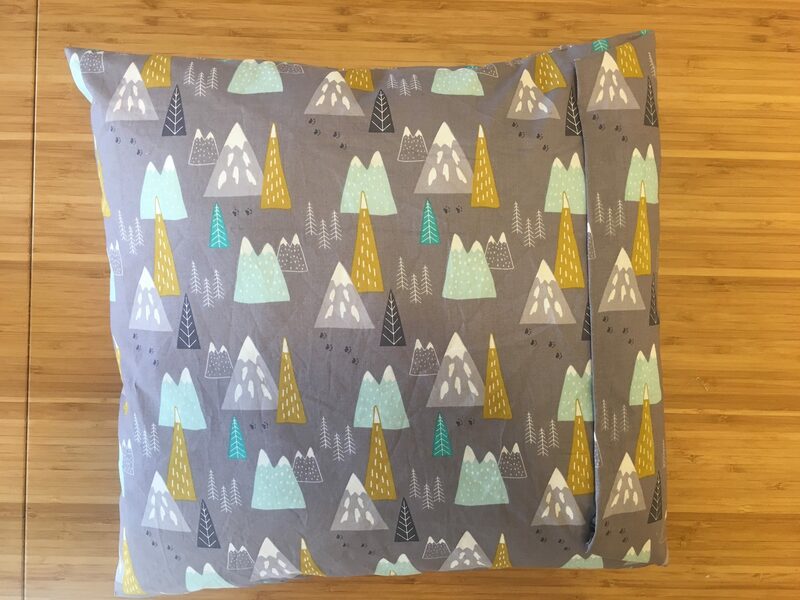 Liam’s love for the outdoors was the inspiration for this mountain themed boys bedroom. After a few weeks of painting, hanging, ordering and rearranging… I am pretty happy with the finished room! The space felt cramped and there was just a lot going on. I was using an old shelf that was once a shoe rack (notice how it’s leaning?! Yikes) for the books. 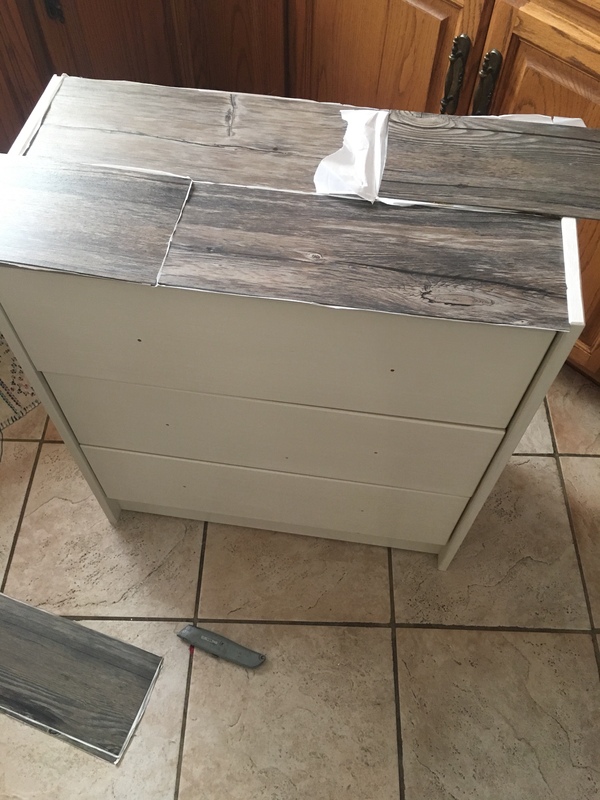 We had found the dresser (that we used as a nightstand) in the clearance section of IKEA for $12. 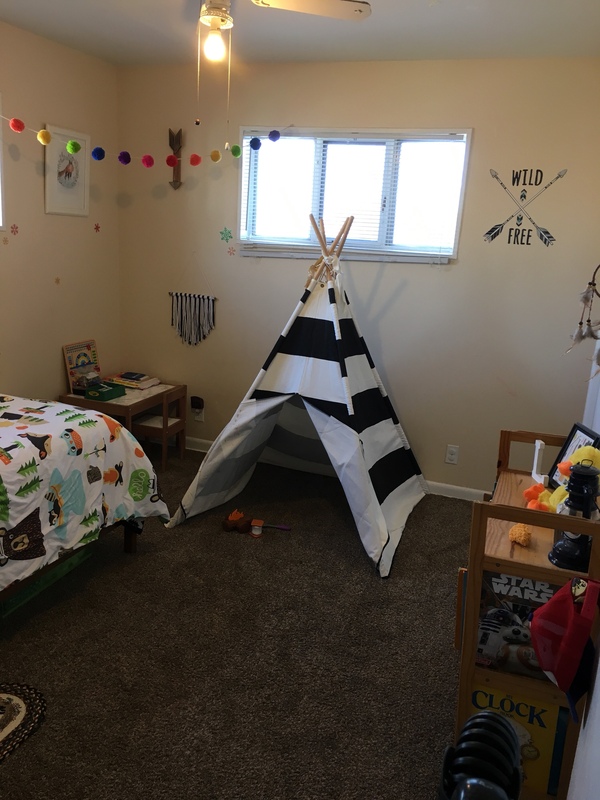 The teepee is from Land of Nod and though it’s adorable, the bedroom is just too small for it. We decided to keep it in his bedroom for now, just propped up in the corner. That way the teepee becomes novel again when we set it up for him. The bedroom wasn’t terrible but I definitely didn’t enjoy it, and Liam really didn’t either. He has a large playroom in the basement so all of his toys are there. This room is just for sleeping and reading and when he wants to quietly draw. I watch kids in my home full time so Liam has to share everything, all the time. Which is just fine, of course, but I wanted to make sure he had his own space too. A space he didn’t have to share and that the other kiddos couldn’t go into if he didn’t want them to. If I could paint the walls, Oh the things I could do ! But, alas, we are in a rental! I made the black and white yarn wall hanging a couple years ago and it seemed to fit right into the gallery wall. I tried using the nails that were already in the wall from the previous art so we wouldn’t have as many holes to cover up before we move out of this rental! The bed frame is from Wayfair and a total steal at only $137 ! I like this one specifically because it has two height settings for the platform. This is on the higher setting so we can slide his lego bins under the bed easily. But for a younger child, having that lower height setting would be great! Goodbye old rickety shoe rack! Hello adorable little bookcase. Liam and I will often bring home a stick or rock or really anything that stands out to us. We put them on shelves, in the window sills, all over the house! Liam wanted this specific stick on the bookcase, so there it went! I have had this lantern for several years but I think I got it at a thrift store! 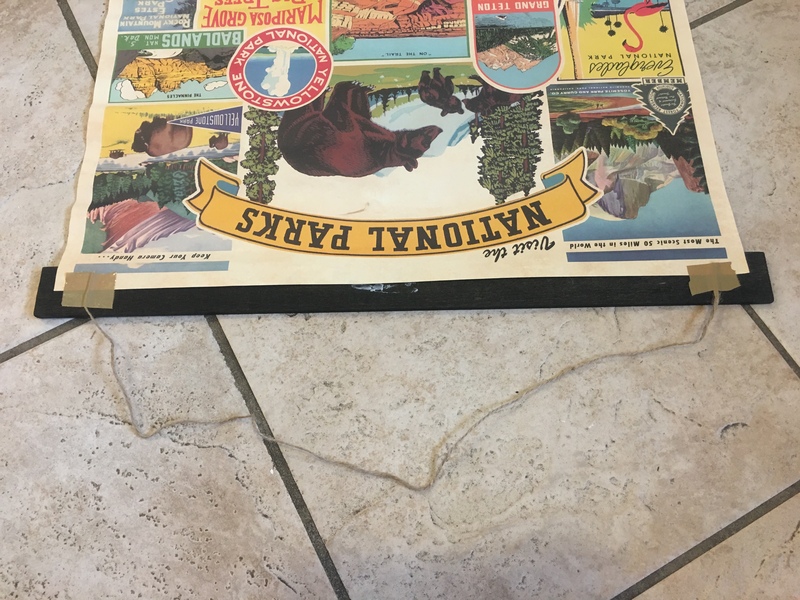 This wood tray was a Melissa and Doug packaging and for now is working just fine to display some curiosities that we have picked up over the past year. Liam likes to study them and we talk about the different textures colors and where they came from. I switch them out occasionally for different rocks, geodes, sea shells etc. Here you can see that faux wood detail on the back of the bookcase. I loved how this turned out too! We have so many books that I have a rotating system. There are two bins in his closet that I will switch out with the ones on the shelf every couple of months. This helps keep the books novel. We read 3-4 books every single night and then books throughout the day as well, so having a large variety keeps Liam engaged and interested. I love the bottom bins of this bookshelf because now we finally have a place for Liam’s favorite stuffies! We have his elk, bison and brown bear peaking out. This old school desk was a $30 Craigslist find! I considered painting it but loved the old worn-in detail too much. The red crayon swirls on top (from Liam) confirmed my decision to not paint it! Now I don’t have to stress about him drawing on it ! His teepee still stays in his room for now, just propped up in the corner here by his closet. Now when I take it down it’s all new and exciting again! This cork board is from Hobby Lobby and looks perfect above the old desk. Liam can now hang up whatever he wants including his art and projects from school. 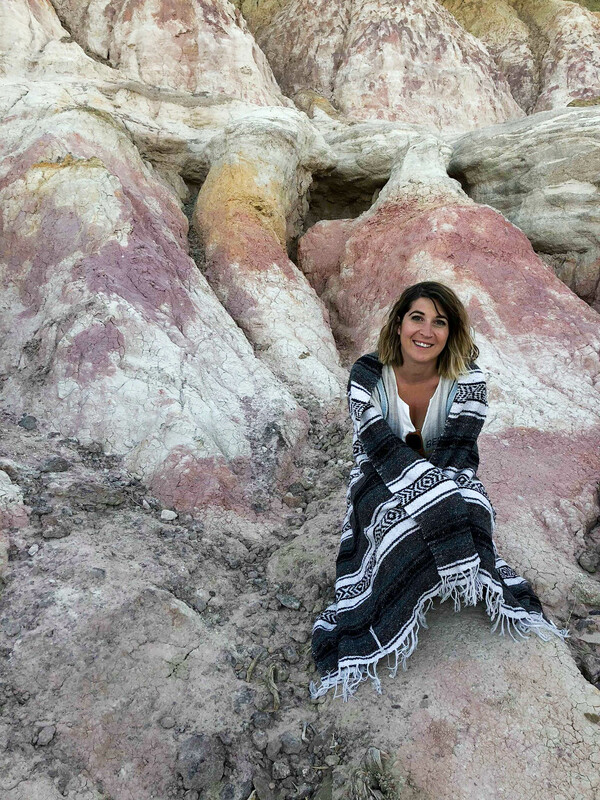 Our favorite crayons are soy all natural handmade crayons from Earth Grown Crayons. Liam loves the woodland shapes so we keep them out on top of his desk. The campfire nightlight is from Amazon. 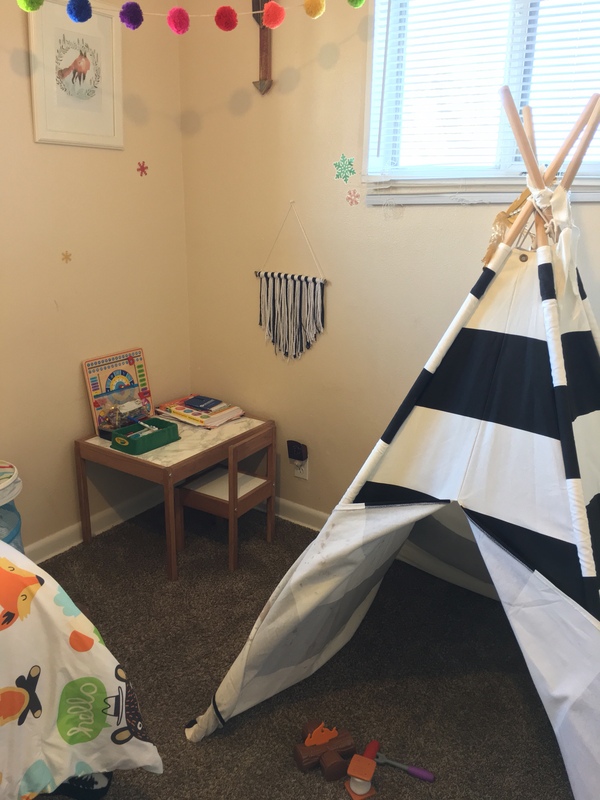 When I took down the teepee the space felt SO much larger! I still wanted a simple reading nook so I threw a soft faux fur rug under a bean bag chair and added a wall shelf for some of our favorite books. 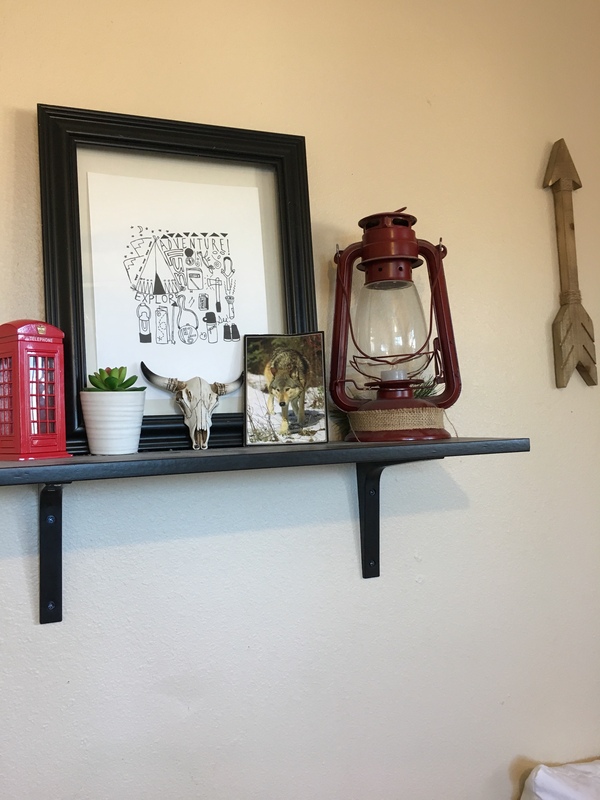 This shelf was only $15 on clearance at Target! This shelf will also display different books depending on season and holiday. We already switched these out to show our favorite Valentines Day books and next will be Easter! This little blue pillow was in the Target dollar section two or three years ago. I just love those little $3 and $5 pillows! This adorable Colorado pennant is from a really great Colorado owned small shop called Saraschalliol (c/o) I just used thumbtacks to hang this because it gave me a bit of nostalgia of all the pennants I had as a child and used clear thumbtacks to hang them on my wall. This little dream catcher was mine when I was a child, the black and white mountain painting is from Hobby Lobby as well as the wood arrow. Liam actually picked out which little treasures he wanted to put on the shelves and I have to say I am impressed! 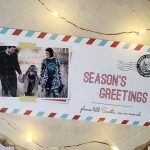 I am sure we are going to have a blast switching out the little treasures throughout the year! I just love this piece so much I may have to buy one for my living room! 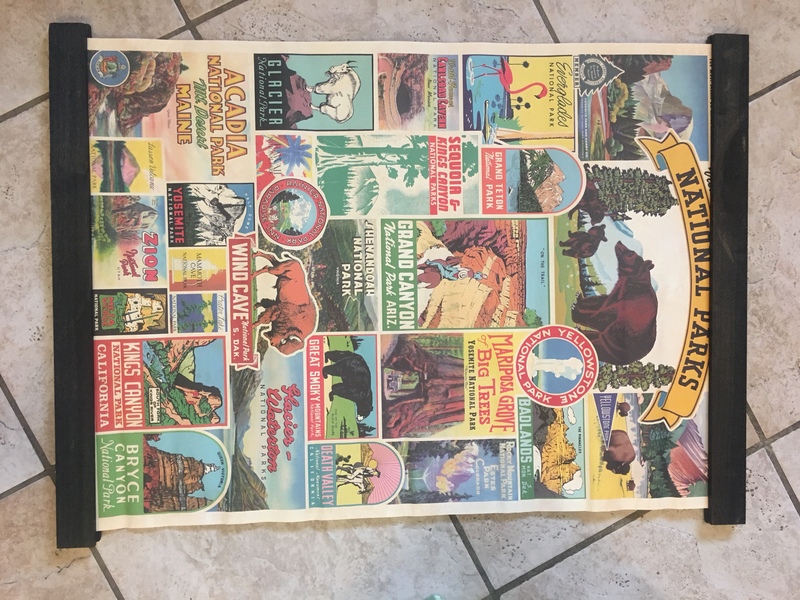 This is actually just a post card that we bought from the National Museum of Wildlife Art in Jackson Hole Wyoming. If you live near Jackson or ever take a trip there, I HIGHLY recommend going to this museum if you have kids. The children’s section fo the museum was amazing and we spent a solid two hours playing there! 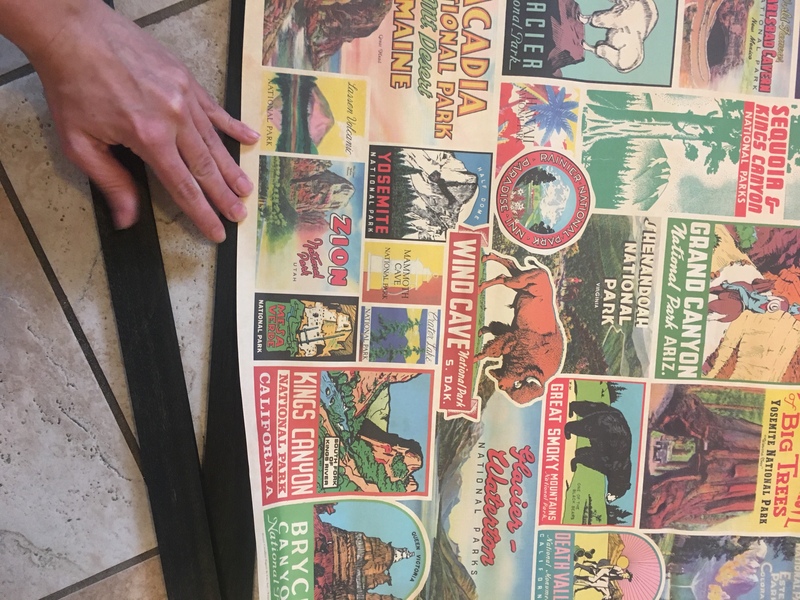 The frame we already had but had bought it at Goodwill for 50 cents a couple years ago! I used a command hook for Liam’s favorite hat. I framed an image I found on Pinterest and placed that on his nightstand. The lamp is from Wayfair and I have a Young Living diffuser next to his bed too. 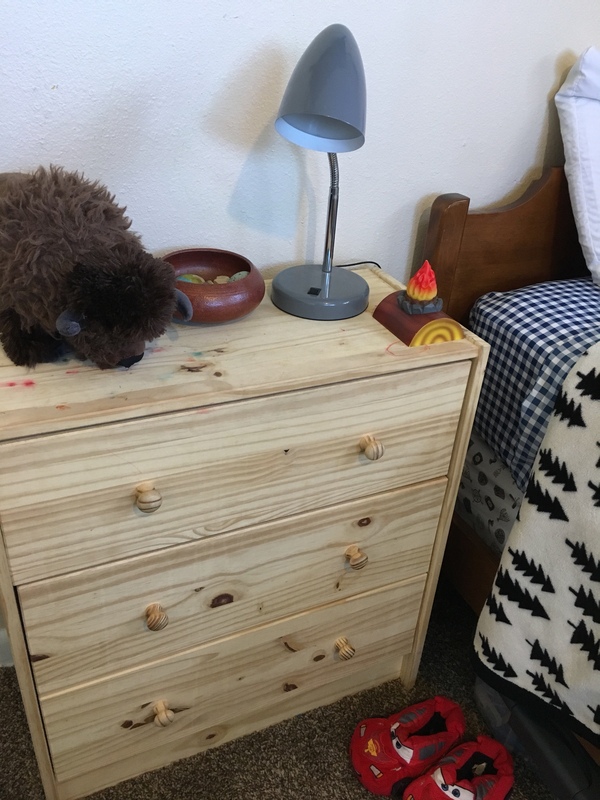 I really love how the dresser turned out! The faux wood planks on top really gave it that extra something. I did want to switch out the hardware and found the most perfect knobs at Hobby Lobby but had already reached my budget for this room. I like it the way it is though! This rug is from Hobby Lobby and though I probably should have gotten a larger size, you cannot beat the price ! I happened to get this when it was 50% off so it was only $22.50! Not too shabby. The sheets and bed spread we had, both from Target. The pillow I actually made and love this print so much! The fabric is from, you guess it, Hobby Lobby. 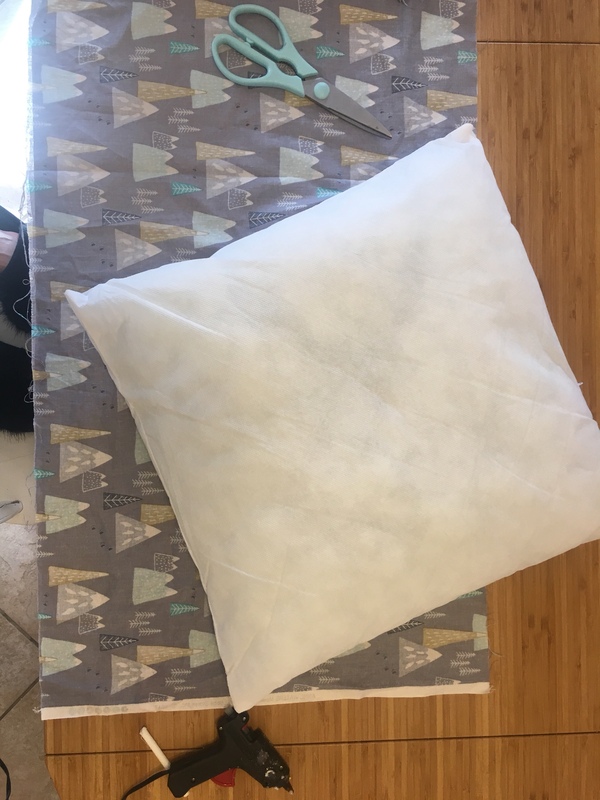 I already had an insert pillow so I made this no-sew pillow with just hot fabric glue! 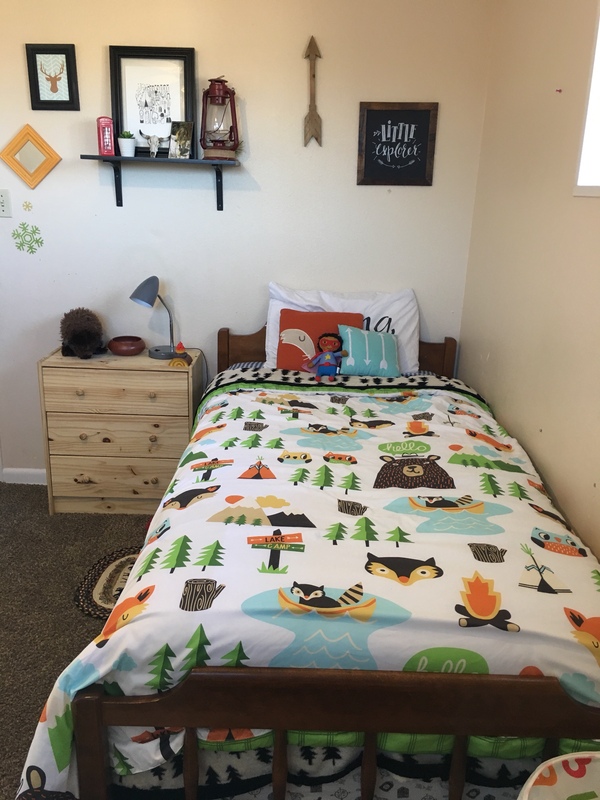 (Instructions below) I would love to go Pinterest-approved crazy with the throw pillows and such but this bed is for a five year old and I will be lucky if I can even get him to pull his blanket up to “make” his bed! #reallife I do think I will make another pillow case for his bed pillow in that beautiful mustard color. 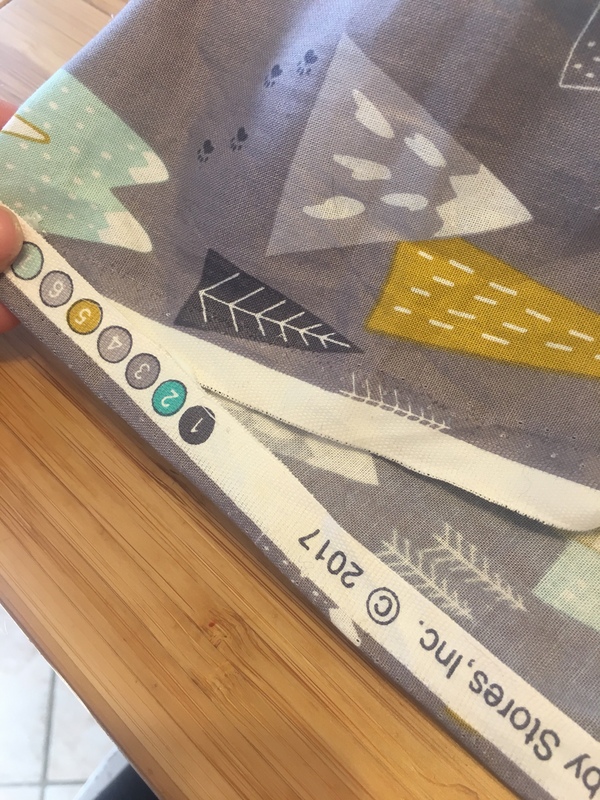 For now it’s just a Pillowfort brand (Target) pillowcase. 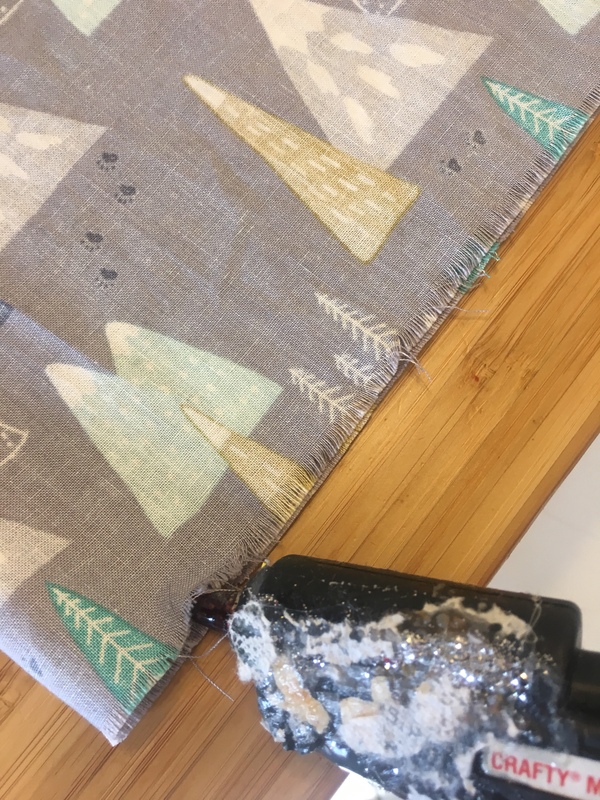 Don’t judge my glue gun! It’s gross, I know! make sure to poke your corners through all the way when flipping right side out! This next part seems difficult but because I had no help taking the photos while making the pillow, it may seem confusing. 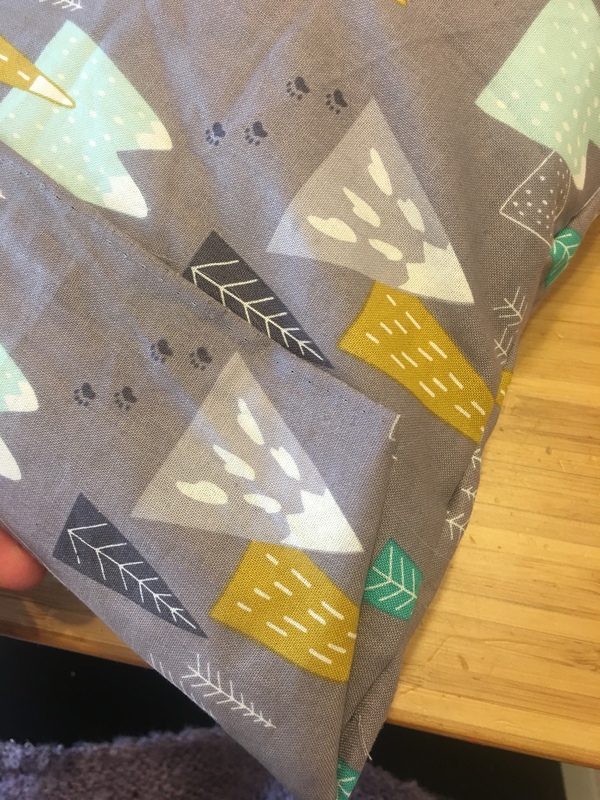 I basically just folded the fabric neatly over and then glued it down! I contemplated making curtains for his windows but a few things deferred me. 1. He is a rough and tough boy that may decide swinging from the curtains is a great idea 2. Hanging curtains means drilling more holes in the wall and 3. 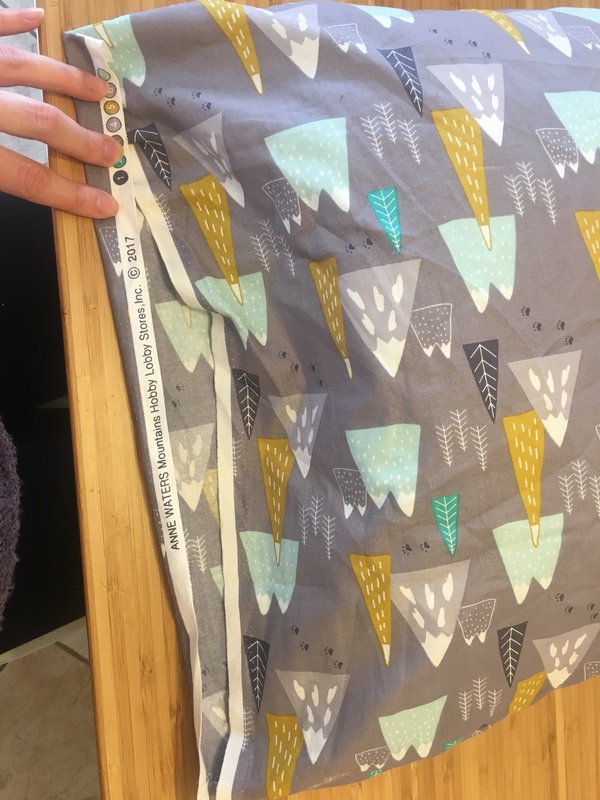 I couldn’t decide on a fabric anyways! So for now, the windows will stay as they are. If we owned this home, the carpet would be ripped out for hard woods, the walls would be painted etc… sigh. Some day! 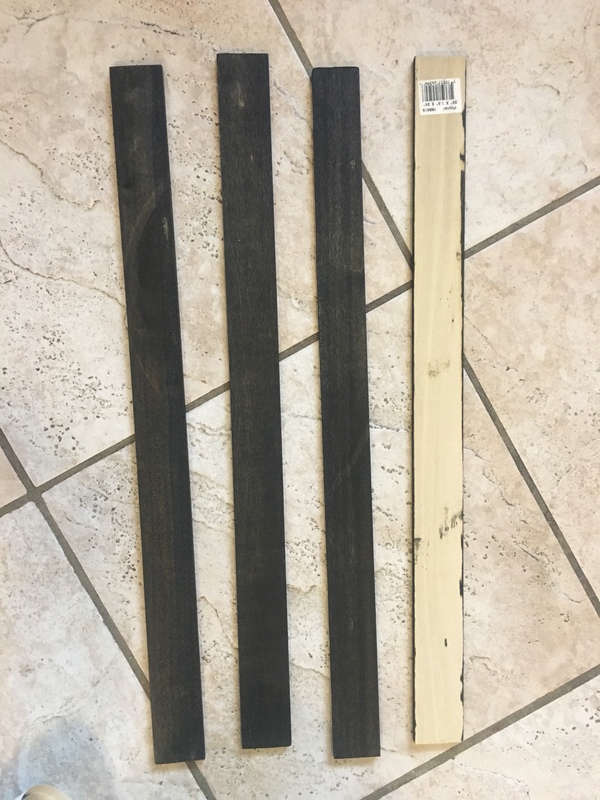 I bought two pieces of poplar from Home Depot that were already cut into the width I wanted. Nathan used a saw to cut the two pieces in half and then I stained them with an ebony wood stain. I only did one light coat because I didn’t want them too dark. I wanted a rustic feel to it. Once the four pieces of wood were dry I then used wood gorilla glue to glue the two pieces and the paper together. (Photos at the bottom of this post for instructions) The top piece I also glued in some twine I already had to hang it by. This was SO incredibly easy and I just love the way it turned out! 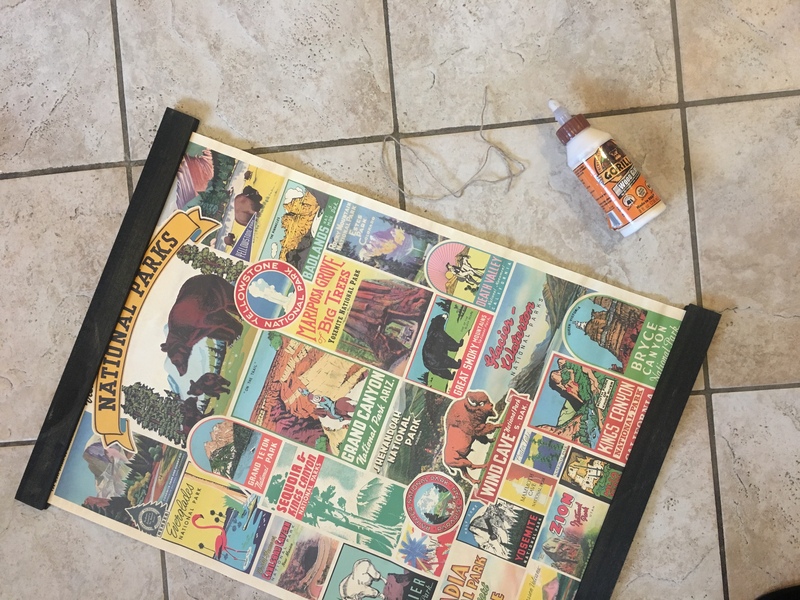 Handy dandy Gorilla wood glue! I taped the twine down first and then used the wood glue. Make sure you let this dry for a couple hours before hanging! The trick to these is making sure you are measuring at least three times to make sure it is exact. 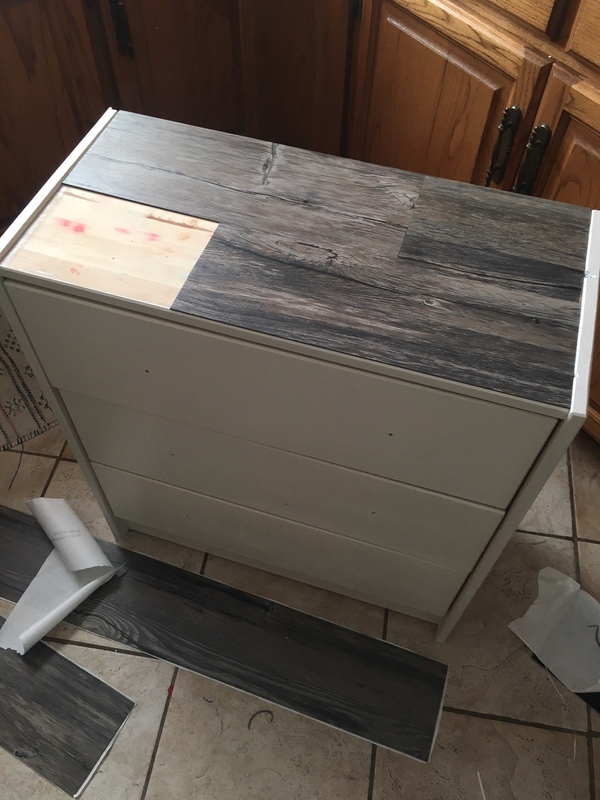 We used a box cutter to scour the top of the laminate and then just bent it back and forth until it cracked. I spent a total of $20 on these and still have a couple left over. I got mine from Home Depot but it looks like if you need a smaller quantity like I did, they are cheaper on Amazon. Take your time! These are a bit difficult to take off if you mess up and need to move them. Measure measure and measure again! 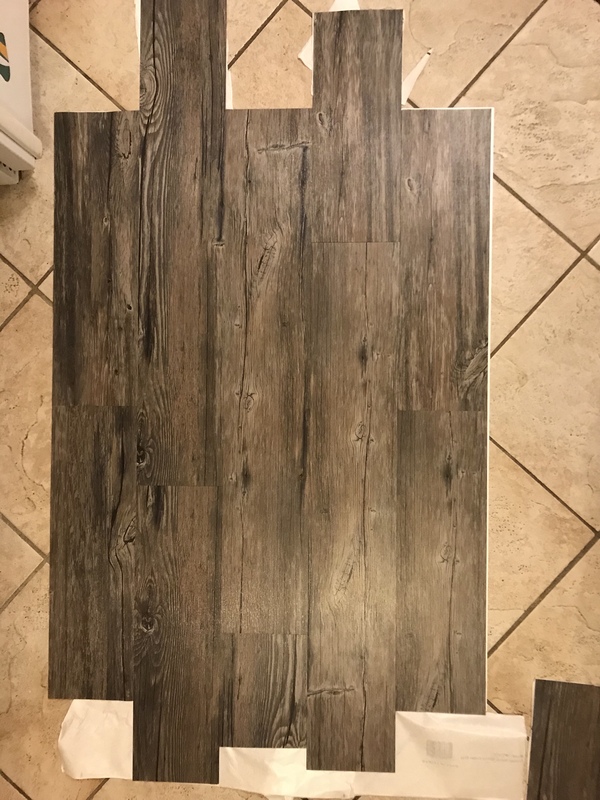 These peel and stick laminate pieces are pretty self explanatory but I wanted to share a couple quick tips. 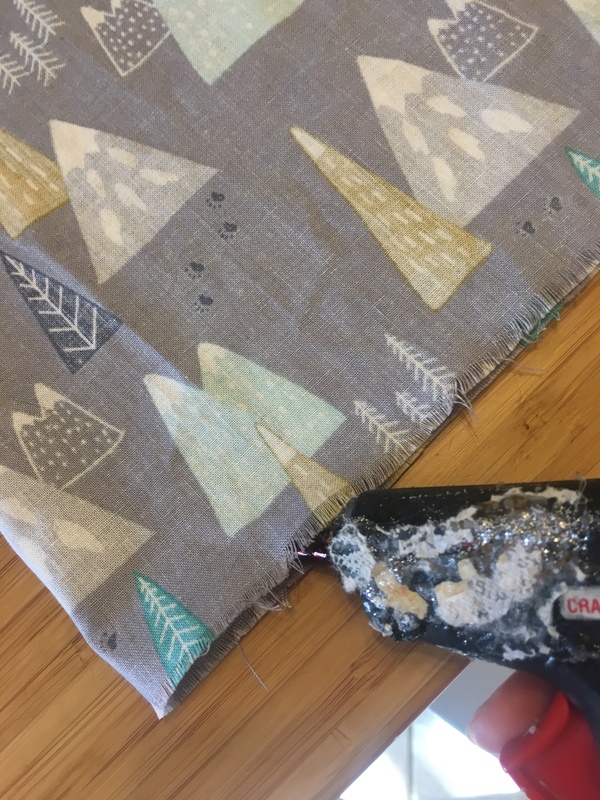 First off, make sure you are laying them out how you like with the paper backing still on so that you can move them around and play with the different patterns of the grain. Once we had it the way we liked it, we did one piece at a time and really moved slowly. This is much easier with two people ! Then you want to make sure you are pushing the pieces all the way together so they are sitting flush with each other. We did end up with one tiny sliver of white showing through and just used a fine tip permanent marker to cover it up. You can’t even notice it now! 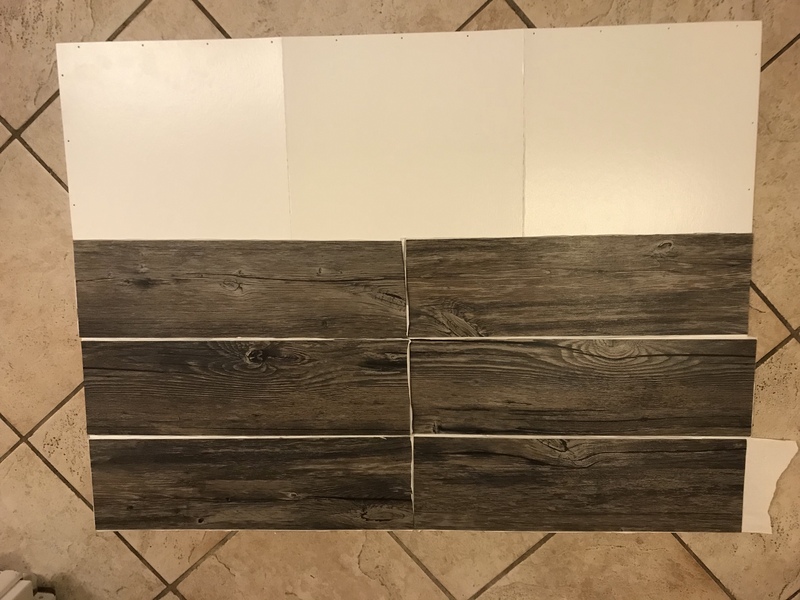 What’s great about these laminate faux wood planks is that they come in several different stains so you can really personalize your piece to fit your space. You can really do this to any bookcase, too! This one was so easy because the back of the bookcase is just a cheap piece of cardboard and not solid wood. So this is what we did instead! We layered them on we wanted, just like you would laying them down on the floor. I think it looks MUCH better this way! Other little decor items we have just acquired over the years! I really love how simple and easy to clean this space is now ! Liam spends way more time in his bedroom now and I love being in there too! Now to start working on my master bedroom…?? I spent under $400 for this room! And if I would have waited for everything to be on sale, would have saved even more. 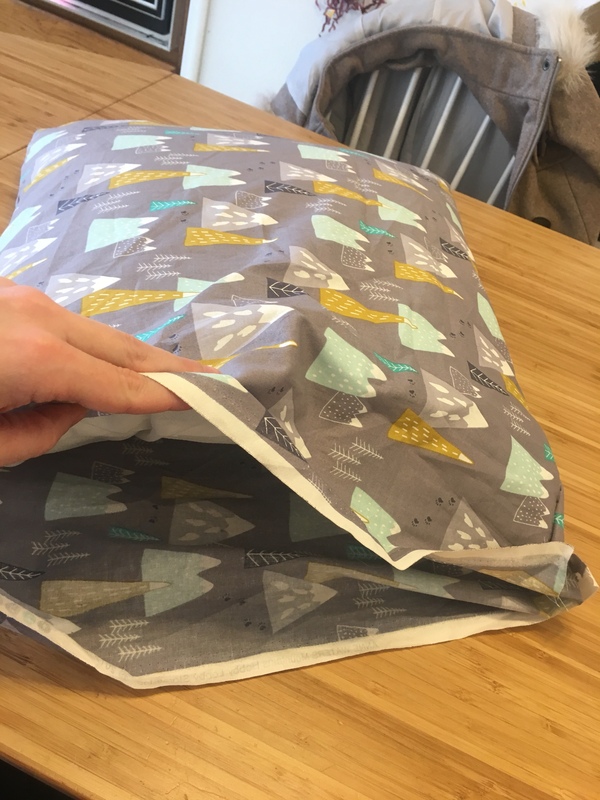 I did already have the bedding so that saved some money but try to be patient and look for those sales! 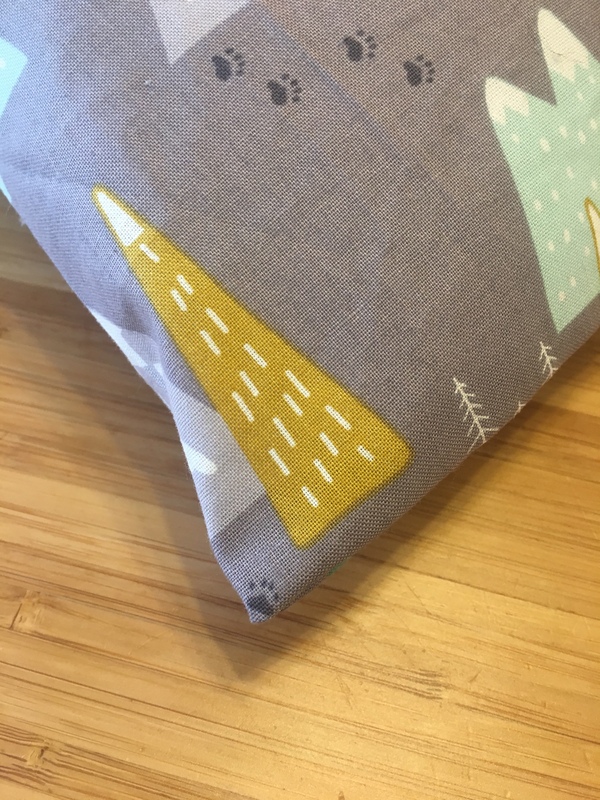 Target will often have the Pillowfort brand on sale or have the coupons on their cartwheel app. 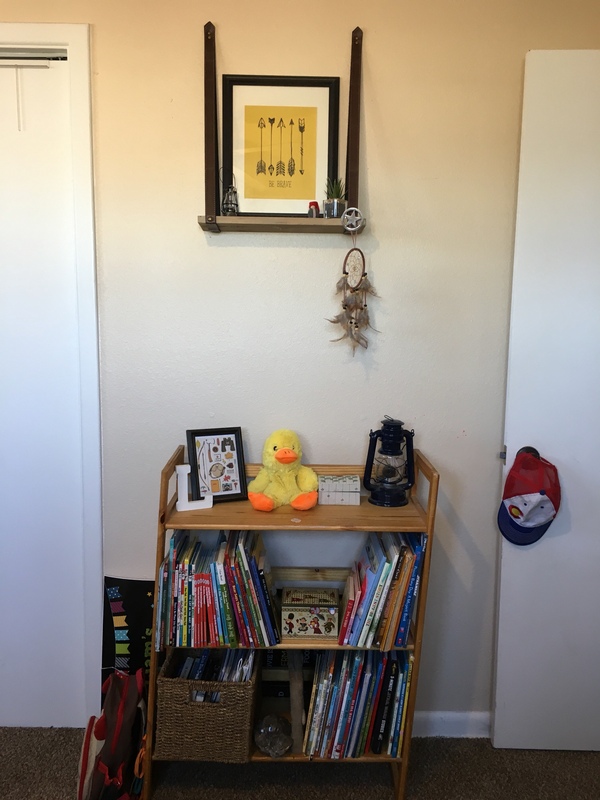 I could have gotten a used bookshelf much cheaper at a thrift store or craigslist… there are so many ways to save money and cut costs. I think the best spaces are carefully and mindfully curated over time. I know his bedroom will continue to evolve and I will be adding in more details here and there throughout the year. I do hope you like this space as much as I do. It really is cuter in person, I have to say. But even still, I am proud of it and had such a blast putting it all together. A huge thank you to Adam from WoodburyWoodworksCo for making these stunning mountain shelves for me, Sara from Saraschalliol who made me this perfect felt pennant and to Melissa who sent me these handmade crayons my son just adores. 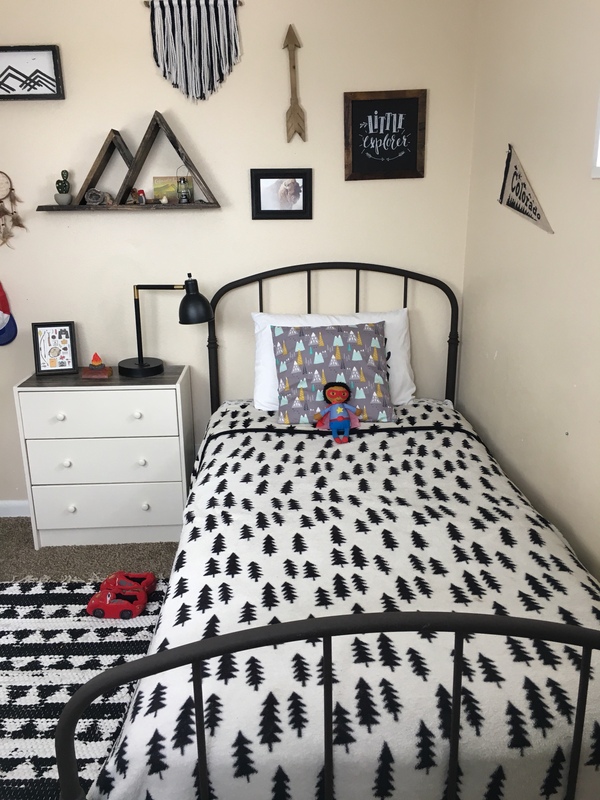 Thank you so much for checking out my son’s bedroom reveal! 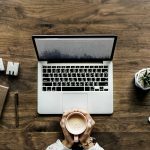 I did my best to link to the products I have or a product very similar. If there was anything I missed or if you have any questions at all, please let me know down in the comments below! I love this theme! Super cute! I absolutely love this theme! It is so unique. Very cute for a little one! Such a creative space for a little adventurer! I especially love the mountain shelf and the rug! This is so cute!! 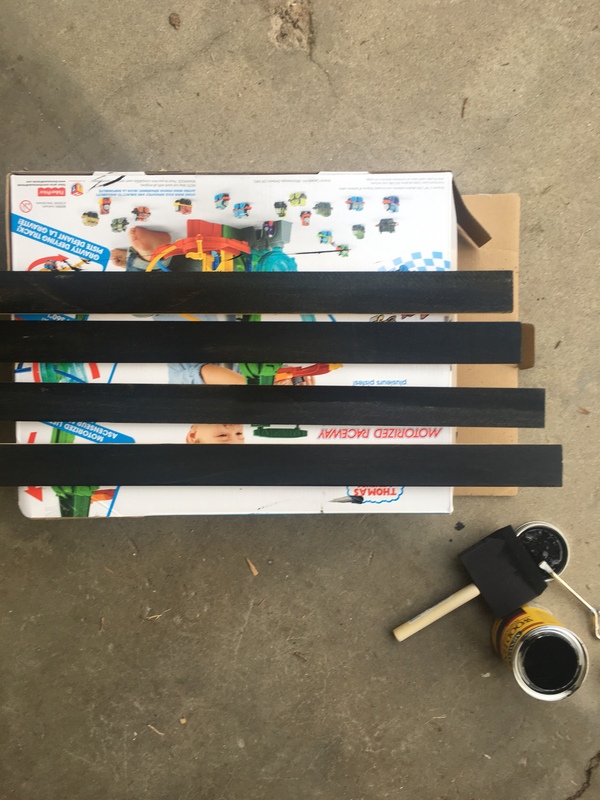 We’re redoing my son’s bedroom now that he has a “big boy bed” and are doing a similar theme! We have a little cabin bed, a campfire light, and some mountains on the walls. I love the mountain shelves! I’m going to have to look into one or two of those to fill his walls! This is a very unique idea for a room theme. I really like it! Thanks Allison! Yes he loves it ! I love this theme and the decorations you have! The camp fire nightlight is so cool! Thank you ! Yes I love the desk too ! It’s the perfect size so he will eventually need a larger one but I love that this one has storage. Feeling the new Justin Timberlake “man of the woods” vibe. Like it! 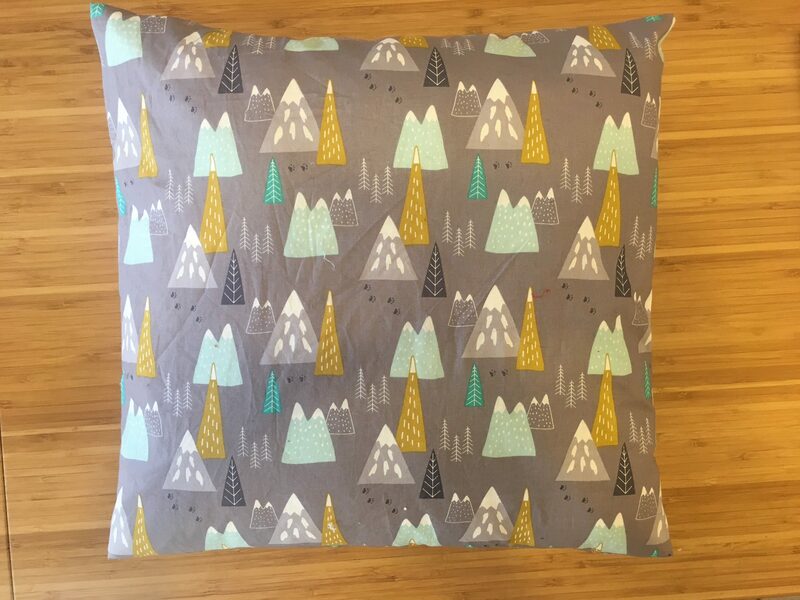 Adorable mountain themed bedroom that’s actually unisex! My daughter and husband would love this room. Thank you ! I know I would have loved it when I was little too! This is adorable ! Perfect for kids .. I love the lantern ! I love this space mama!! We love all things nature for my son, this is great inspo for his big boy room! 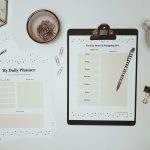 I’m from the Mom Bloggers Unite FB group- shared and followed you on twitter! This is super cute! I love how you bring nature into the room so naturally. The Melissa and Doug tray filled with random nature pieces is a great idea! Thank you so much !! I really appreciate that ! ❤️ their wood packaging is the best. We use them all over the house ! What a beautiful and well thought out room! Love it! I love it!! Rugged chic ❤ Good job mama!! That is such a cute room I love the black and white! Just love the cohesiveness of this theme, right down to the details. 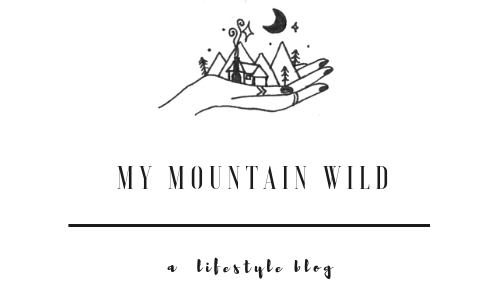 Mountains, wild animals and nature – everywhere!! Good job!! This theme is adorable!! 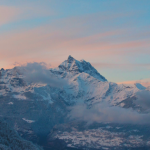 I love the mountain shelf! I know my son would love to put rocks and feathers on it that he has collected.